Amazon is running an awesome offer for its both old and new customers because it got the highest number of unique visitors in May (In India). Note :- Orders below Rs.499 will have Rs.40 delivery charge. -Purchase any product (excluding Gift Cards ,eBooks and Apps) today on amazon.in and get a Rs. 100 Amazon Gift Card. -Each customer is eligible to receive only one Rs.100 Gift Card, irrespective of the number of orders placed. -The Gift Card will be credited to the Amazon account after 30 days from the close of the offer period. Note : Amazon has changed the terms and conditions . 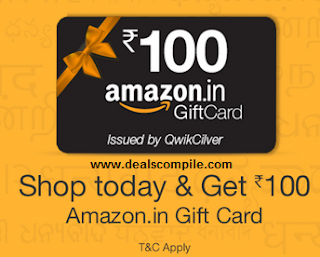 Gift cards bought on amazon will not be given the Rs.100 GIft voucher. So please buy any other product.